Gain Up to 18 lbs Mass in 5 Weeks! The Ultimate High Calorie Mass Building Weight Gainer! For over a decade millions of athletes have trusted Up Your Mass to help them add extreme muscle mass, strength and speed recovery. 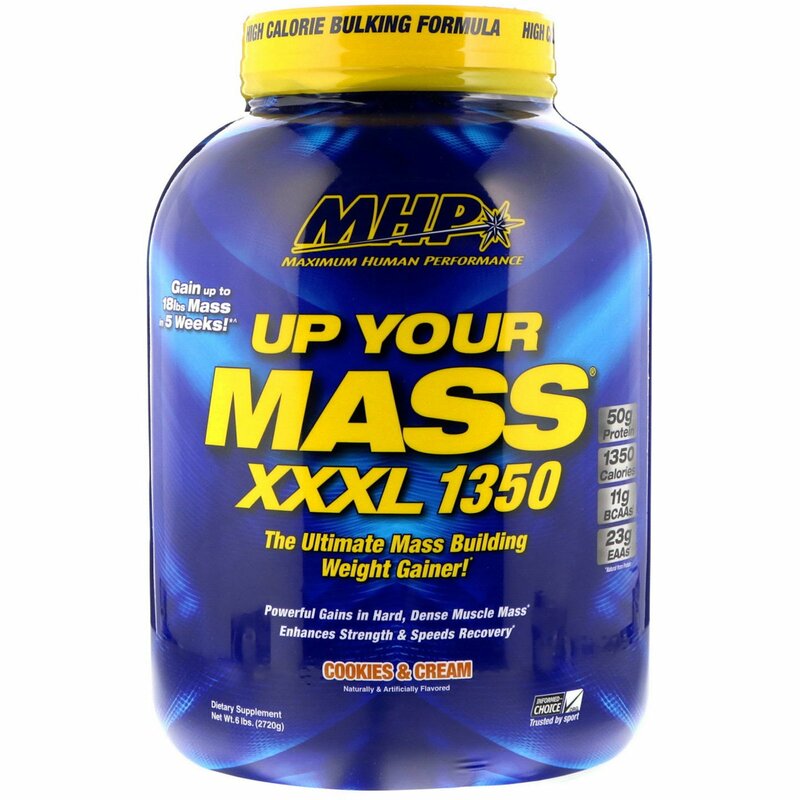 Now, MHP brings the next generation in mass building excellence with Up Your Mass XXXL 1350! This scientifically advanced mass packing formula is designed to complete your nutritional program and is so powerful, it can help pack on up to 18 lbs. of mass in just 5 weeks! The superior quality and quantities of muscle building nutrients in UYM XXXL 1350 makes it the ideal weight gainer for anyone trying to pack on quality mass quickly. Informed-Choice Certified and Tested for Over 200 Banned Substances on the WADA list. Produced in a GMP Compliant Facility. A highly advanced protein matrix loaded with 50 g of fast digesting (whey protein concentrate, whey protein isolate and hydrolyzed whey protein) plus slow digesting proteins (micellar casein and milk protein) provides both fast and long-term nitrogen retention benefits. UYM XXXL 1350 is also loaded with mega amounts of Glutamine and Branched Chain Amino Acids (BCAAs, leucine, isoleucine and valine) in every serving - all of which are critical for muscle building, strength and recovery from workouts. MASS Load Complex Carbs: The type and quality of carbohydrates used in any weight gainer will determine the type and quality of mass you pack on. Only UYM XXXL 1350 contains Mass Load, a unique agglomerate of complex carbohydrates (micronparticulated maltodextrin, sweet potato, oat fiber and quinoa) that helps optimize the anabolic effect of insulin, allowing your body to build dense, high quality muscle mass. The advanced Mass Load carb blend also gives you sustained energy, fast glycogen replenishment and helps keep blood sugar levels stabilized within the normal range. And, unlike much of the competition, UYM XXXL 1350 has zero added sugars. Fatty Acid Complex: Most weight gainers make the crucial mistake of ignoring one of the most important macronutrients for mass building - dietary fat. Fatty acids offer numerous benefits including promoting healthy testosterone levels within the normal range; slowing digestion for a more stable insulin and glycemic response; enhancing nutrient absorption, especially of fat soluble vitamins; and supporting muscle strength and recovery. UYM XXXL 1350 also offers a variety of the right kinds of fats for mass building, including palm oil, flaxseed, borage seed, MCT powder and CLA. Tastes Great, Mixes Instantly! 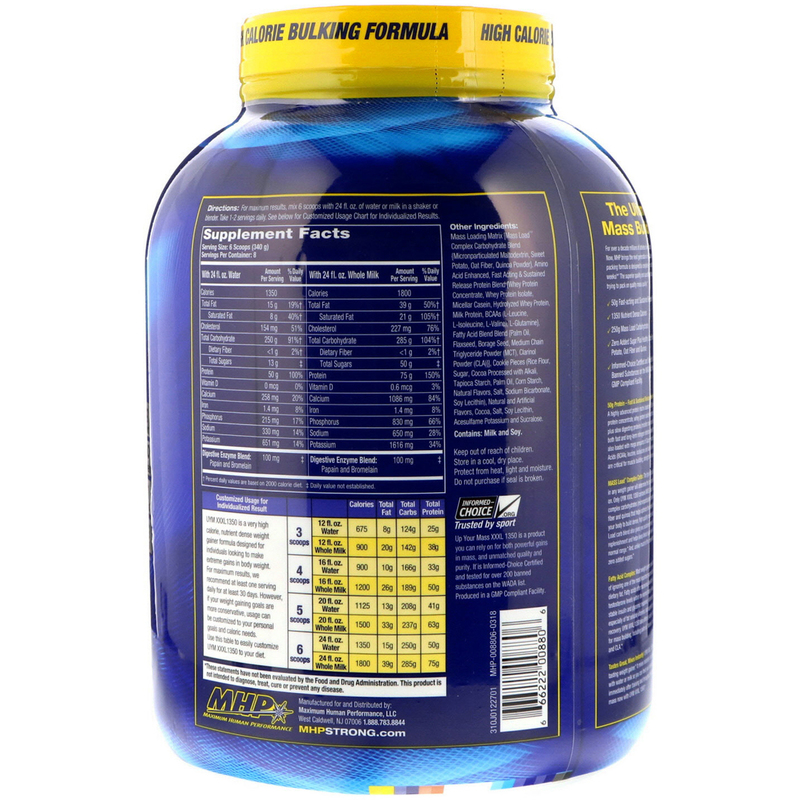 UYM XXXL 1350 is a high quality, great tasting weight gainer. It mixes instantly in a shaker (no blender required) with water or milk so you can feed your muscles high quality calories immediately after training and throughout the day! Start gaining maximum mass now with UYM XXXL 1350! For maximum results, mix 6 scoops with 24 fl. oz. of water or milk in a shaker or blender. Take 1-2 servings daily. See below for Customized Usage Chart for Individualized Results.